Rising above requires showing up every day. Whether you’re putting in work on your jumper or battling it out in the post, you need gear as obsessed with perfection as you are. Find adidas socks constructed with moisture-wicking fabric to keep you cool for all 48 minutes and extra cushioning that comes in handy when you’re pulling down rebounds. Basketball leg sleeves offer compression to keep you warm, prevent cramps and reduce recovery time on tough back-to-backs. Lightweight, comfortable ankle braces let you hit those handles with confidence and cut past defenders. 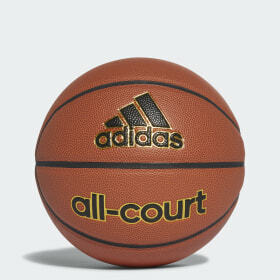 adidas basketball accessories are built with attention to detail and innovative technology to help you cook on the court. Since its 1891 inception, basketball has been marked by innovation and extremes—finesse and force, artful execution and gritty grind. adidas entered the mix in 1969 with its game-changing Superstar and has stayed true to the spirit of the sport with new technologies and boundary-pushing styles that help athletes own the court. Today NBA icons like Damian Lillard and James Harden continue to inspire and evolve the 3-Stripes heritage with signature footwear and apparel that showcase their unique approaches to the game.